The U.S. Environmental Protection Agency feels your pain. That’s what the EPA seems to be saying through its Arsenic Removal Technology Demonstration Program. Initiated in 2002 — the same year federal limits were dropped from 50 micrograms per liter (μg/L) to 10 μg/L — the program seeks out and verifies low-cost solutions for utilities struggling with arsenic removal. The latest breakthrough shows tremendous promise: The first (and only) full-scale deployment is saving the participating utility $20,000 to $30,000 per year. The savings are gained by backwashing and regenerating, rather than repurchasing, iron-based adsorptive media — a major development considering many utilities’ tight budgets and the rising cost of replacement media. The EPA partnered with Battelle, an applied science and technology development company, to demonstrate the ability of a caustic solution (sodium hydroxide) to strip the arsenic from spent media in a lab setting. In 2009 the project went full-scale at Twentynine Palms Water District in California, where it has since been adopted as regular operating procedure, post-EPA demonstration program, and continues to thrive. Startup requirements for media regeneration are relatively modest — chemicals, feed pumps, and tanks — but there are certain mitigating factors, discussed below, that should be evaluated before adopting the process. The right candidates, however, could be on the cusp of significant savings. 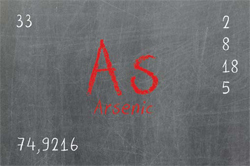 Arsenic is an odorless and tasteless semi-metal that is naturally present in aquifers throughout the country, and thus also shows up in well water. At concentrations above the EPA’s maximum contaminant level (MCL) of 10 μg/L, arsenic can cause skin damage, circulatory problems, and an increased risk of cancer. It is a common issue for many small communities — and an expensive one. “A lot of people are out of compliance because they just can’t afford the cost of arsenic treatment,” said Ray Kolisz, operations manager for Twentynine Palms, who often travels to waterquality conferences to speak on adsorptive media regeneration. For traditional treatment, the biggest expense is purchasing new media. According to EPA research engineer Tom Sorg, 80 percent of utilities that treat arsenic do so with adsorptive media, and 80 percent of the operating cost is for media replacement. Sorg, who was responsible for taking regeneration from the lab to Twentynine Palms, also noted that ironbased media, particularly Bayoxide® E33, is the industry standard for arsenic removal. Other types of adsorptive media include activated alumina (AA) and titanium- and zirconium-based media, but full-scale regeneration, at this stage, is exclusive to iron-based media. The typical process consists of media inside the pressure vessel(s), where the arsenic adsorbs onto the media. As it starts to lose its adsorption capability, the media is replaced with new, virgin media. The cost savings came through as expected, but the performance of the regenerated media was eye-opening. The new process features upflow regeneration utilizing 4 percent caustic solution (pH of 13) to strip the arsenic off the media. A second step, neutralization, injects 93 percent sulfuric acid into the flow stream to lower the pH of the treated water. The resulting hazardous-waste effluent must be handled appropriately, whether sent into the public sewer system (if available), treated on-site, and/or hauled offsite. 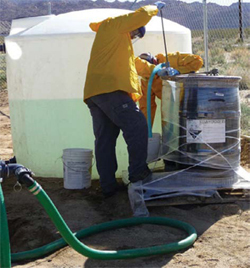 Equipment requirements for Twentynine Palms were two HDPE tanks (3,200 gal) to collect wastewater, a tank (1,000 gal) and pump for the caustic solution, an acid-dosing pump, and a pH meter. Twentynine Palms also underwent minor pipe modifications to the existing treatment system, including plumbing for upflow and downflow application of the reagent, before regeneration could begin. Located in the Mojave Desert in Southern California, San Bernardino County, the Twentynine Palms Water District covers roughly 86 square miles and serves a population of approximately 17,800. When the updated MCL came out, the water district had three wells that were above the allowable limit. Two were shut down because of their age — “It wasn’t worthwhile treating those wells,” said Kolisz — and one was treated with Bayoxide E33 adsorptive media as part of a conventional use-and-replace treatment program. Raw water at the site in question, Well 11, averages 16 μg/L of arsenic. The EPA and Battelle, having proved media regeneration in a lab environment, sought out Twentynine Palms to pilottest the process in the field at full scale. The treatment system consisted of two vessels, each with 69 ft3 of media. One vessel was set up to regenerate the spent media, while the other vessel’s media was replaced with virgin media. To say the test results were positive is an understatement. The cost savings came through as expected, but the performance of the regenerated media was eye-opening. Despite the somewhat harsh process of removing the arsenic from the media, the regenerated media showed zero signs of degradation after use; in fact, it performed better on its second run, outshining even the virgin media. Kolisz explained that this was likely related to oil residue originating from the oil-lubed vertical turbine shaft pump that interfered with, or “blinded,” the media. The caustic used to strip the arsenic off the media for regeneration essentially cleaned it of everything, thus improving performance. Today, Twentynine Palms continues to regenerate media at the 400-GPM Well 11 site — now served by two parallel vessels — removing 90 percent of accumulated arsenic with each regeneration (and still no indication of media breakdown). The efficient arsenic-removal rate allows some raw water to be bypassed and blended with the treated water, while still staying far below the regulated limit. There are two major responsibilities to recognize before taking on media regeneration: operator training and wastewater disposal. A main reason Twentynine Palms was chosen for the EPA’s demonstration program was the utility’s familiarity and training with adsorptive media regeneration — not for arsenic removal, but for fluoride removal. Twentynine Palms regenerates activated alumina to remove naturally occurring fluoride, so it had comparable equipment and training in place. For traditional treatment, the biggest expense is purchasing new media. Most utilities will be starting from scratch, however, from a learning standpoint. Safety training is equally important. Operators need to exercise caution when working with sodium hydroxide and sulfuric acid. They need to be trained in safe use and handling, and always wear proper personal protective equipment (PPE). The effluent produced from the regeneration process is also dangerous, at least from an environmental perspective. 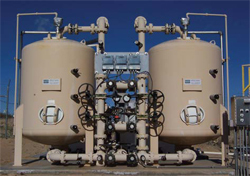 Twentynine Palms, which is not connected to a centralized sewer system, was initially forced to haul the effluent for offsite industrial treatment, which cut into its savings considerably. Much of the savings was recouped once the utility began treating the wastewater onsite — using ferric chloride to precipitate arsenic from the effluent — after which only a small amount of residual needed to be disposed. Though Kolisz called disposal “a major cost,” it’s worthy of mention that when Twentynine Palms was paying for wastewater removal, the entire media regeneration process was still 60 percent less expensive than repurchasing. Communities and water agencies that are piped into the sewer system are in better shape, as sewers are deemed an appropriate and acceptable discharge point. A third factor to consider before adopting regeneration is attaining proper permission. “Any time you change a process, you have to get state approval,” the EPA’s Tom Sorg reminded. A final point of consideration, submitted by both Sorg and Battelle research scientist Vivek Lal, is the acknowledgment of a “break point” where operations would be too small to realize the value of media regeneration — where replacement is the less expensive option. “I suspect that the break point would be between 25 and 50 ft3” of media volume,” estimates Sorg. The cost-saving opportunity from regeneration is variable depending on the amount of media typically used and frequency of replacement, but Twentynine Palms Water District serves as a good gauge of potential. With each regeneration performed in lieu of repurchase, Twentynine Palms saves nearly $15,000. The utility reports the cost of media replacement to be $20,500 per tank for Well 11, compared to chemical expenses of just $1,000 per tank and current disposal costs of around $5,000. Even with the initial, one-time investment for minor pipe modifications and design work (less than $5,000) coupled with the former disposal cost of $10,000 (prior to instituting on-site treatment), Twentynine Palms saved $5,000 on its very first media regeneration. “It saves us quite a bit of money,” said Kolisz. That is perhaps more understatement, considering that Kolisz’s colleagues — the EPA’s Sorg and Battelle’s Lal — attested to the rising costs for adsorptive media. As the price continues to climb, utilities will save even more. And, again (amazingly), Twentynine Palms is still seeing no degradation in the regenerated media. Could it be that they will never purchase media again? While the true potential for this new process has yet to be determined, the opportunity to take advantage of its proven benefits is readily available to water agencies right now.